I am contemplating trying out one of the new Tsunami Soundcar decoders (freight car noises). Does anyone know of power pickup wipers for retrofitting to a freight car, in order to establish electrical power for the decoder, when retro fitting the average box car? I am aware of the existence of replacement trucks such as this one: http://factorydirecttrains.com/ringengi ... 33tho.aspx but I was wondering if there are brass wiper sets you could add to any truck? I think I've found something suitable, anyone have experiences dealing with this company? And yet another cheaper solution for the same problem, pointed out to me via RMWeb. I've received my first Tsunami Soundcar decoder in the mail today. 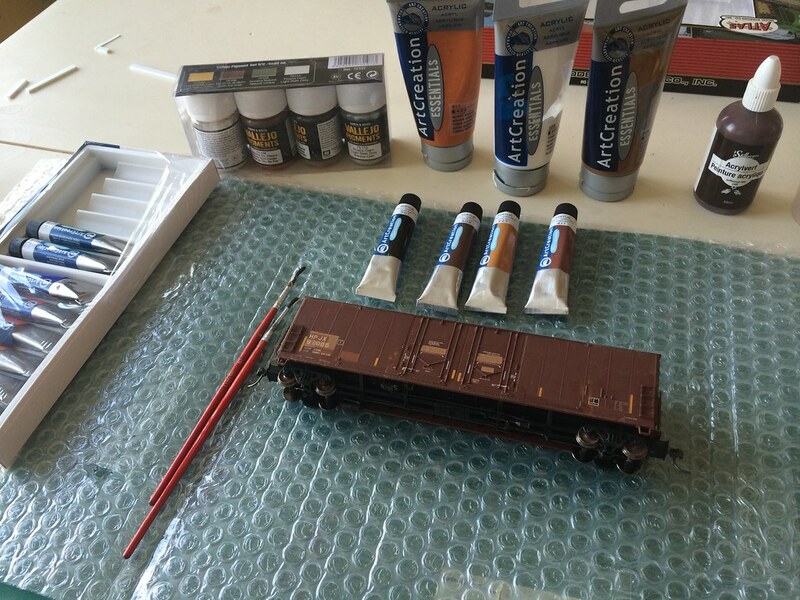 I'm hoping that I'll be able to convert a box car this week, in time for the weekend 'play activities'. I've started the build yesterday. For good operation, the decoder needs to be mounted against the car roof. This enables the 'intelligent' consisting function to be activated with a magnet, when adding/removing the car to a train. You can also add the car to a consist using the same method as you would with a loco, but I think the magnet function is more user friendly, and much faster when you have multiple sound cars (which I am sure I'll get over time). 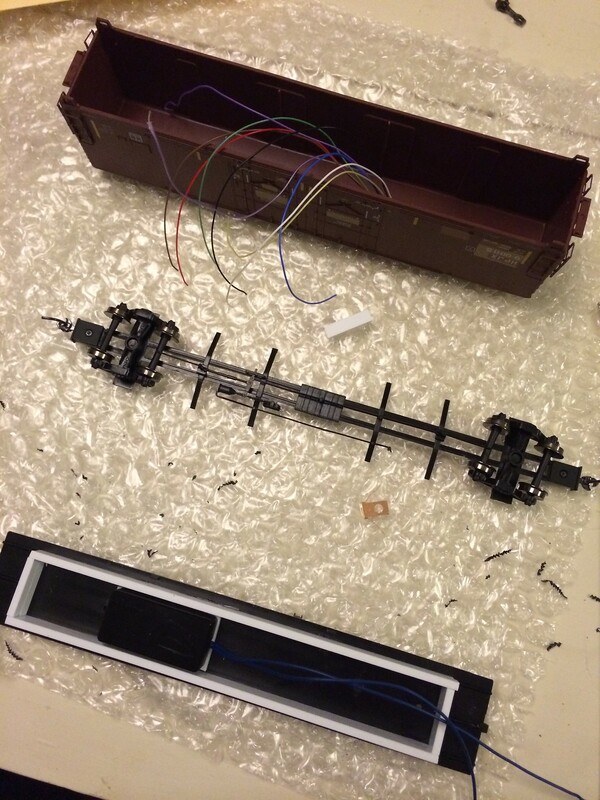 I removed the original weight of this Atlas car, drilled some holes for the speaker in the bottom, and mounted the speaker on the floor, far away enough from the decoder not to interfere with above function. I then build up some styrene strips to form a box in which leadshot or similar weights will be added. next on the to do list is the addition of the power pick up wipers to the truck, using one of the methods described in this thread. I've used thin nickel silver wire (handrail wire) on a caboose with success. I soldered very fine flexible wire to the pickup wires, then I threaded the wire through holes drilled in the truck cross beams, one end was wrapped around the cross member, to stabilise it and then both ends were bent to make contact with the back of the wheels. The hardest part is the amount of pressure on the wheels, too little and the pickup is bad, too much and the wheels will not turn. Putting the max weight in the car will help. yes I intend to make this a fairly heavy car. I've just received a box of self adhesive lead weights that are normally used to balance car wheels. They are strips of 12, each weight being 5 grams. That should help with the weight. I'm finished. 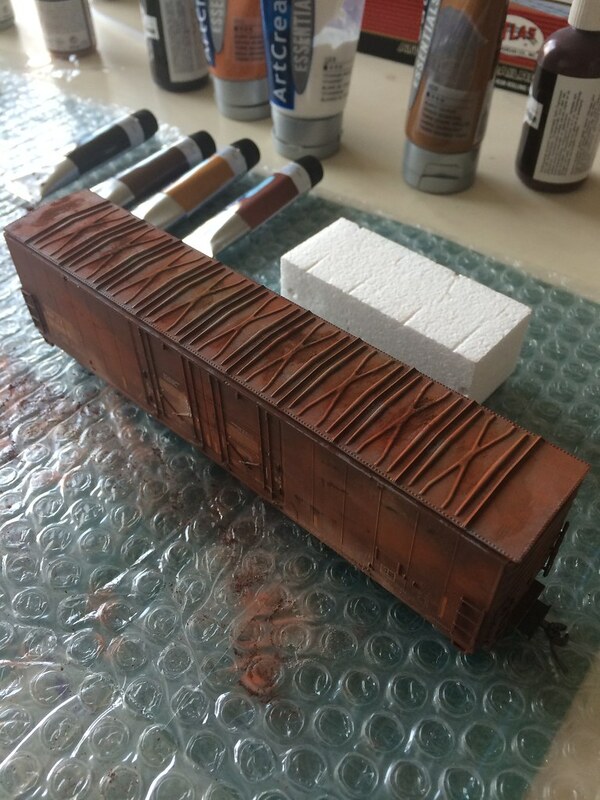 The technical stuff was completed today, and I followed up by some weathering. for better performance and contact, I added additional weights, by using the balancing weights for car wheels. These are usually 5 gram weights, that come in strips and have adhesive tape fitted, and they are fairly cost effective too. The car now weighs in at nearly 200 grams, which should be enough. Here's a few pics while being weathered.